Mom had a vintage wicker tray that was brown and had an old decal on it. scrapbook paper to resemble a quilt. that I made several years ago. then a cold wind moved in last night and it's back to sweater weather. me so happy. I am miserable when he's not feeling well. I hope Bentley is back to his old self. It is so hard to have our animal family members hurting. Just like a very small baby, they can't understand why. Our Abie is almost 19, blind, and has a cough we can't cure. But she still wants to do her share here on the ranch, biting cows and going with us while we are working. Love her. I'm sorry to hear about Bentley I have a very loved shih-tzu and know how worried you are when something isn't right ! Susan your posts are always so pleasing to the eye and inspire me to try a few crafts myself. Hope all is well in Texas. Give Bentley a hug ! This would brighten my day and make me feel really special right about now! So pretty! And my favorite color...pink! 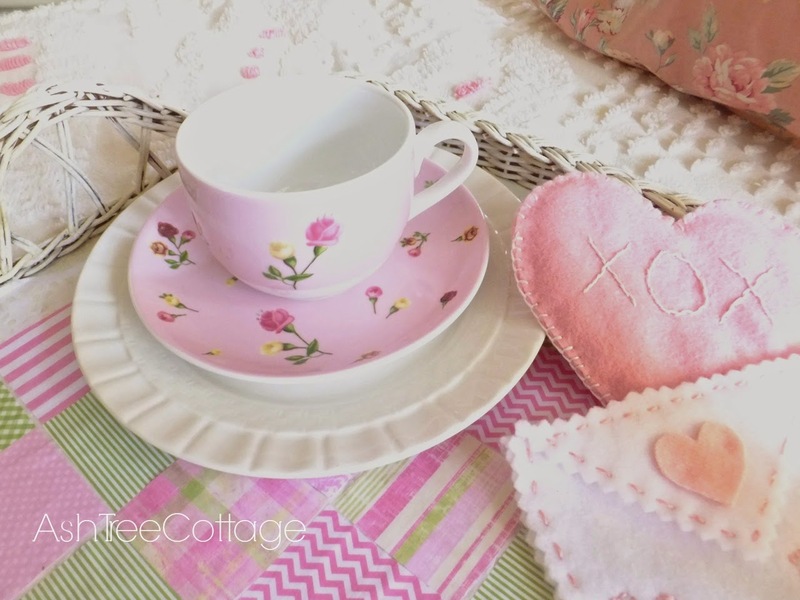 Your Valentine Breakfast Tray is very pretty. I like that you used scrapbook paper to make it look like a quilt. The little Valentines are so cute. Susan, your tray is gorgeous! 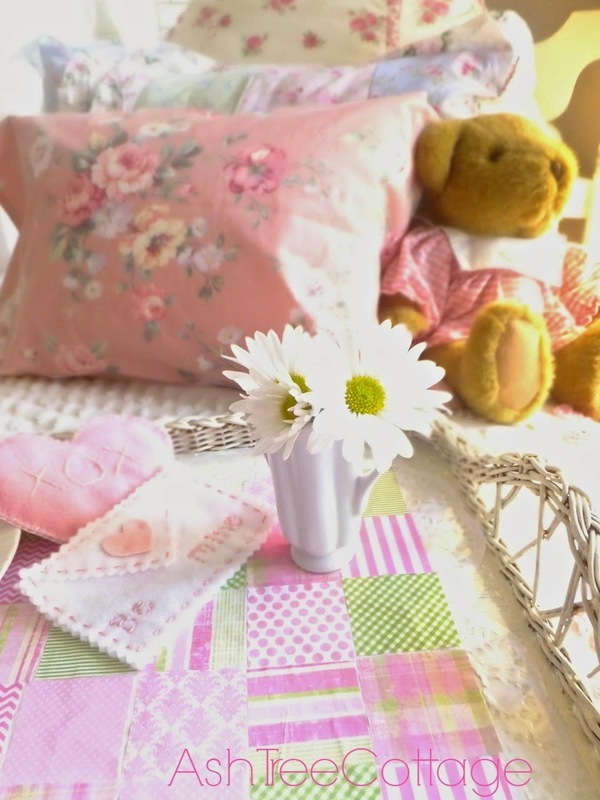 I love the shabby chic look! So prretty! I'd love to be served on that tray! Sorry to hear about Bentley, but I'm glad he's okay now. Well, I don't think I've ever seen such an adorable tray in my life! White is always such a radiant refresher and the decoupage is darling. Very crafty, Susan; you have spring all to yourself! Your decor is lovely. I pop in now & then when time allows. I'm very sorry Bentley hurt his back but glad he is doing better thanks to good TLC. Gotta love our pets. Oh, how lovely. 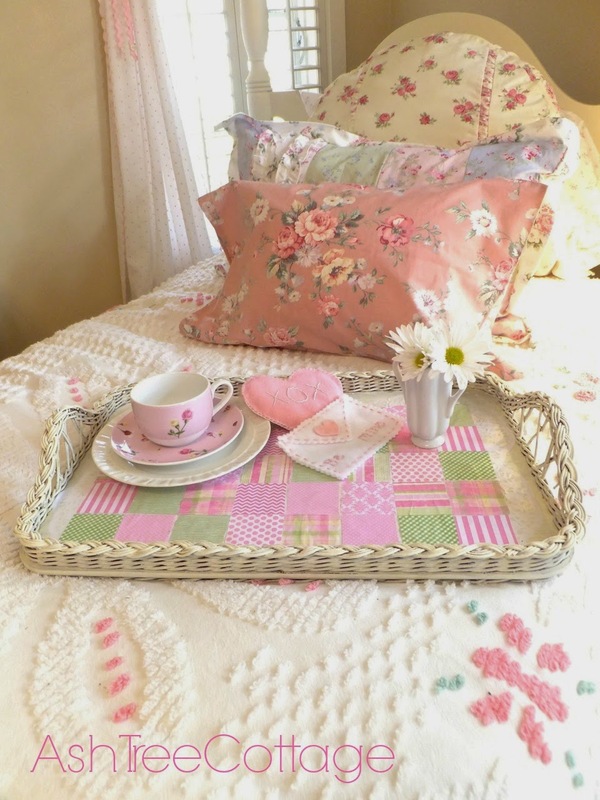 My Mom still has her tray on her bed with her favorite tea set. Your bedroom is gorgeous. 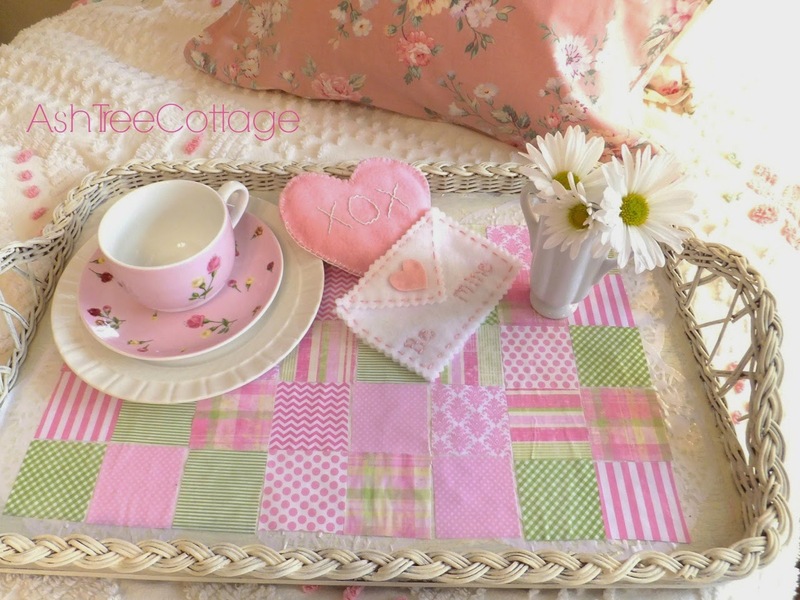 The tray and Valentines look so pretty. Nice job Susan. Poor Bentley, I hope he is much better by now. Our Cheri jumps off our very high bed and now I am a bit scared for her. What a sweet and pretty room. I would feel right at home in such a lovely space. The tray is gorgeous and the tea cup is a beauty. Thank you for sharing. Great job with the tray. It looks so pretty on the bed, and it dresses up well for Valentine's Day. Susan, Your blog page is DELIGHTFUL! Makes me feel all warm and cozy. Bella Pics too!